Use the medical form below, if requested by your instructor, and you’re taking a Recreational or Primer course from GUE. Use the medical form below, if requested by your instructor, if you are taking a Rec 3, Tech or Cave course from GUE. 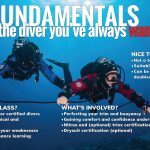 If you are taking a GUE class with the aim to enter Tech or Cave training in the next year or so, you should use this form instead of the REC form. Non-certified divers doing a SCUBA experience with GUE, use the form below.